Stylish, neutral and classic, the patent-pending "Claire" is the perfect breast pump bag for the stylish mama on the go! She's named after Sarah's oldest daughter (Maddy Claire) who, through their exclusive pumping journey, inspired the creation of the company and bags. There are limitless ways to style this fashionable breast pump tote: carry your Claire by the wide cross-body strap or by the high-quality comfort handles; or pop her over your suitcase handle using the innovative built-in luggage sleeve. 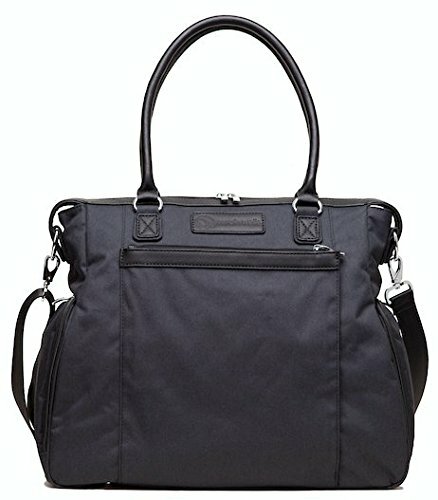 With room for a breast pump, pumping accessories, keys, laptop, phone, and more, the Claire breast pump bag is ideal for the on-the-go mama! Fits portable pumps including: Medela Pump in Style (with or without a case), Sonata and Freestyle, Hygeia, Freemie, Spectra, Ardo and Ameda and more! 12 (!!) pockets inside & out, including an exterior front zip pocket (with internal organizing pockets) for easy reach and an innovative back-of-bag luggage sleeve that converts to a zippered pocket.